Have you read the first post in this series, Creating Your Family Culture? If not, please head to Create Your Family Culture to get started! Every organization has a culture. We see it in corporations, sports teams, and our jobs. If an organization’s culture doesn’t happen by design, it will happen by default. Your family is also an organization, and your family has a family culture. We love encouraging parents to design their own family culture instead of letting it happen on accident. Being intentional helps steer the course for our family. Creating an intentional family culture has dramatically changed how we parent, invest our time as a family, and spend our money. We are FAR from perfect, and we make lots of mistakes. But, we’ve slowly learned to make choices we feel are best for our family, rather than just let life happen to us. We can’t answer that. That doesn’t sound very helpful, does it? The fact is, answering that question would be a disservice. One of the biggest benefits to creating your family culture is the process itself! Connect with your spouse and have conversations about priorities, share hopes & dreams, brainstorm ideas, work toward consensus — all of this is an important part of the process. If you’re a single parent, this process is still important! Consider this process yourself, or work through it alongside a trusted family member or friend. The process of creating your family culture begins with one question. Just one! Easy, right? What do we want for our child long-term? My husband and I invest a LOT of time talking, praying about what how we want our family to be. We share the dreams we have for our kids. We discuss what values, qualities, skills, habits, and education we want for them. When our kids leave home at age 18, who do we want them to be? Which skills should they have? What do we want them to know? What do we want them to have experienced? We need to start there. We need to begin with the end in mind. Because the truth is, we are not raising kids. We’re raising adults. It’s our responsibility to prepare them for their adult life. We need to begin with the end in mind. When we have a clear view of where we want them to end up, it makes our current parenting decisions clearer, too. We’re not talking about choosing their career for them, their passions or life purpose — that isn’t up to us. 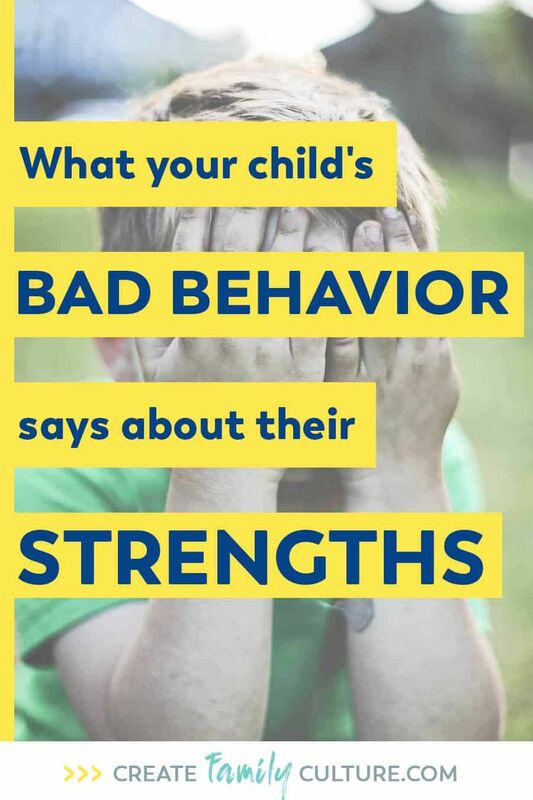 But, we can offer opportunities for them to learn certain character traits, values, skills and experiences that equip them for anything they end up doing as an adult. 1. Get the Creating Your Family Culture, Step by Step Guide. YES, I WANT THE CREATING YOUR FAMILY CULTURE, STEP BY STEP GUIDE! Did we lose you at “distraction-free?” 😃 Reality is, this is hard for many of us! Pick a time after the kids are in bed, do a date-day while they’re in school, hire a babysitter – whatever you need to do in order to have focused time to talk with your spouse or, if you’re single, think through the questions in a quiet place. The responsibility we have as parents is worth the time and effort. 3. Work through Step 1 of the Step by Step Guide. Fill it out as completely as you can. Spouses will not agree with everything, and that’s ok. But, there is usually enough common ground in the answers that parents have a good foundation to start building their family culture. We encourage parents to hold onto this sheet! Cultures aren’t built overnight. Much like a building, family culture is built brick by brick, day by day. You won’t be able to change everything in a day, week, or month — hanging on to the Step 1 printable will be a great resource when you’re ready to build the next layer of your family culture. We tried that. Many times. And we failed every time! Trying to change too much at one time sets us up to fail. We decided to focus on one thing at a time. One aspect of our culture we were going to work on. Maybe it was adding more fun into our day-to-day life — so we worked on that for a while. Once we felt it was woven into our family’s culture, we moved on to the next thing. Slowly, over time, we saw our deliberate family culture in our life so naturally, it looked effortless. The process of creating your family culture takes time, but the time is worth it. Our kids are worth it! 4. Head to Step 2 of the Guide. Up until this point, all we have is a dream for our kids. We have a wish for what we want our family culture to be. The only thing that can help us achieve our dream is a plan. A strategy. This question transforms your dream into a plan. It catapults your goal from “just talk” into an action plan. Whether it’s a character trait or a chore to learn, one question can guide your way to creating an intentional family culture. The question? How can we increase the odds of this happening? Now that we know where we want to go, how do we ensure we get there? We walk through this next step in great detail. Are you ready to read about Step 2? Take Me To Step 2!